I load my Plott hounds back in the dog box and lay the freshly skinned pelt in the truck toolbox alongside another equally prime mountain bobcat. I’ve collected two huge toms on two turnouts in less than four hours cruising a couple of back roads. Bobcat hunting doesn’t get any better than that, and it is only noon. “What a great way to spend a cold winter’s morning,” I think to myself, already forgetting the rigors of clambering and climbing up and down the rough and rocky side gorges above the Colorado River, where it gushes through Gore Canyon southwest of the mountain town of Kremmling, Colorado. I’d left home an hour before daylight under cloudless skies and nonexistent wind. Six inches of fresh tracking snow had quit falling around midnight, ideal conditions that guaranteed any track found would be fresh. During the 20-mile drive to lower canyon country, I checked three different tracks that crossed the road, but all appeared too small to put the dogs on. Then we crossed the first big tom’s track, and they treed that cat in a matter of minutes, in a steep canyon less than 100 yards from the truck. We crossed two more medium-sized tracks within a short distance, and a half-hour later, the dogs were hot on the second big cat’s track. That cat covered several miles working in and out of the rocks before the dogs finally jumped it and put it up. I was feeling pretty chipper when a couple of miles farther down the road I spotted another track crossing the road. A closer check revealed a road-killed deer in the ditch—surrounded by very large cat tracks. At first, I thought the tracks belonged to a small mountain lion; they just looked too big for a bobcat. But the smoking-hot tracks headed across a sagebrush flat into a small canyon surrounded by open country, and I figured the deer-gorged cat was probably bedded in the rocks of that canyon. I wanted to get a trophy cat with a predator call, and this was too good of a chance to pass up. If calling failed, I’d still have time to return to the truck and put the dogs on the track. A half-hour later, I was setting up under a low cedar on the downwind rim of the canyon. With my .220 Swift on the bipod, I sent a series of muted but plaintive cottontail whines, whimpers and squeals bouncing down the slope. It was less than 300 yards across the canyon and not much farther to the head of the rocky defile, so I kept the volume down. When I take a stand specifically for cats, I start calling softly and gradually elevate the volume, planning on staying at least an hour to give a cat plenty of time to stalk in. Most of the cats I’ve called have come in slowly and cautiously. Twenty minutes passed, and my eyes were aching from trying to pick out a cat from all of the cat-colored rock. Then, without making a sound, the sneaky feline jumped up on a flat rock 25 yards out in front of me and sat down as nonchalant as a house cat on the couch. Two seconds later, the silvery tom was down for the count, and at a whopping 41 pounds, it still ranks as the heaviest bobcat I’ve ever taken with a call. A fantastic end to a dazzling winter day. Of course, days like that are few and far between. Calling bobcats requires patience and more than a smidgin of luck, especially if you want a trophy cat. Most areas of bobcat habitat are capable of producing a 30-pound tom, and that’s definitely trophy size. But you may have to look over a number of smaller animals to get the one you really want. Gary Roberson, owner of Burnham Brothers Game Calls and one of the most ardent predator hunters I know, stated emphatically that if he was looking for a shot at a trophy bobcat, he’d head for South Texas where the population density is probably higher than anywhere else in the country. Those southern cats don’t have the heavy, fluffy fur of their northern mountain counterparts, but they are plumb gorgeous in their own right, with lots of color and vivid spotting that is lacking in many northern cats. On a recent two-night hunt, Gary and his compadres called up and shot 21 bobcats. The largest tipped the scales at 34 pounds. On an earlier hunt, one of Gary’s predator hunting buddies called up and killed a South Texas tomcat that weighed an honest-to-God 52 pounds. That’s truly a once-in-a-lifetime trophy. Many Texas ranchers allow predator hunting, but for a fee, and outfitters and guides tend to have the best locations sewed up. Gary offered to steer any interested reader to some quality predator guides in the South Texas country he knows best. Byron South, another well-known pro predator caller who also calls Texas home, agreed that South Texas has the densest populations and some of the prettiest cats in the country. However, if a hunter bases trophy caliber on pelt quality as well as size, then Byron advised heading north to the mountain states, where the quality of the fur is unrivaled. Northern Nevada, Colorado, Idaho, Oregon and Montana produce some of the most beautifully furred, heavily bodied bobcats in the world. If there’s a downside, it’s the fact that the population density is far lower than in more southern states. The harsh winters produce the prime fur but also hold down prey species populations, and this naturally limits bobcat numbers, as well. Here again, the best bet if you are looking for a true trophy might be to hire an outfitter or guide who specifically offers trophy bobcat hunting. Due to the recent high prices of the pelts, these felines are managed as valuable furbearers rather than predators or varmints. The states require a trapping license, furbearer or fur taker license, and many enforce a bag limit on the number of cats a hunter may take. If you live in the East, you might want to consider a hunt in Iowa. The state has a burgeoning bobcat population, and the Iowa DNR has opened a bobcat season in the southern two tiers of counties, on a quota basis, limiting hunters or trappers to a single cat. A nonresident fur harvester license is required at a cost of $200. The 2008 season lasted just 16 days before the quota was filled. Pretty solid proof the population is at a peak. Might be a good place to tag a trophy cat. I spend a good portion of each fall guiding whitetail hunters on my Iowa leases, and many of my clients have reported seeing bobcats while on their deer stands. Last fall, I watched seven different cats while glassing for deer. When you see that many of the reclusive critters out in broad daylight, you know the population has to be high. The northern tier of Midwestern and Eastern states, including North Dakota, Minnesota, Wisconsin, Michigan, Pennsylvania, New York, and Vermont, all sustain huntable populations and schedule bobcat seasons. 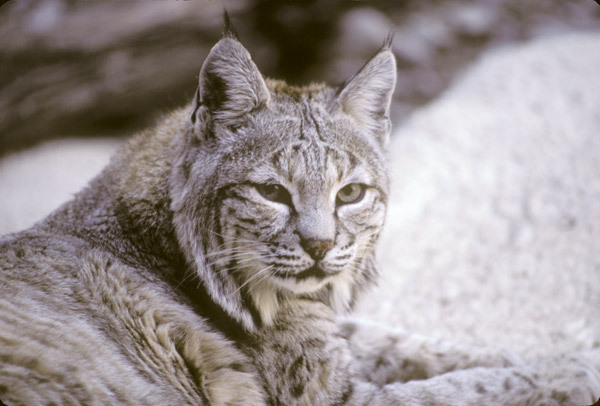 Some of these states have reciprocal licensing whereby they only allow nonresident hunters from states that allow their residents to hunt, and most maintain strict limits on the bobcat take. Still, the states allow hunting, produce some big cats, and most winters they get enough snow for tracking, which in my estimation is the real key to getting close enough to call up a trophy tom. Southern states actually have denser bobcat populations, but getting a trophy cat is more of a crapshoot without the tracking snow. Without the benefit of knowing when you are working a big cat by examining tracks, the chances of calling up a real trophy go down. Still, the harder you work, the luckier you’ll get. On the plus side, I’ve found that when calling in areas of peak population, a higher proportion of the bobcats that do respond are the dominant and thereby larger cats. They just aren’t as intimidated by other predators, such as coyotes and fox. But thank Mother Nature for snow. My preferred method for taking a trophy cat with calling, as well as when hunting with hounds or spot-and-stalk hunting, requires it. I look over as many tracks as needed until I locate a trophy-size animal, and then I concentrate my efforts on getting within calling range of that cat. Cold calling in good country can work, but it is a lower-odds proposition. When I first started calling predators (back about the time electricity was invented, or maybe that was lightning?) I’d follow a fox track in the snow, and when it went into heavy cover where I figured the critter might lay up, I’d set up and call. This worked exceedingly well. The fact that I was young, in good shape, and had nothing better to do with my time helped overcome a lack of calling experience. The same tactic can work for a determined caller trying to tag a trophy bobcat. On several occasions, I’ve followed a big cat’s track for miles, setting up to call wherever I found a rocky slope or willow thicket along a creek where the cat might be hunting or bedded down. Cat’s don’t have nearly the acute sense of smell of a coyote or fox, but I still make sure that I approach the likely lay ups from downwind, even if it means circling a considerable distance to do so. Bobcats do have exceptionally keen hearing, and I rarely call at full volume, opting to get “up close and personal” before calling quietly and gradually increasing to medium volume. With the adrenaline rush that comes from following a fresh track and knowing your quarry is just in front of you, you may find it extremely tough to force yourself to stay put and call for an hour. But cats can be cantankerous, exasperating adversaries, and rarely will a northern cat come storming in on the run as they often do in South Texas. On more than one occasion, I’ve finished a calling session, stood up to leave, and then seen the cat sitting within 30 yards, seemingly in plain sight. Bobcats are masters of the unseen approach, and impatience has been the downfall of many a cat caller. I once tracked a big bobcat through 3 inches of fresh snow for a mile or so to a likely looking canyon. I set up and called from the rim of the boulder-strewn, brushy canyon. I didn’t see the cat respond, so I got up and continued on the track. Three hundred yards up the canyon, I found where the cat had bedded under a ledge. The fresh tracks led from there up a narrow defile to the rim of the canyon, where that fickle feline apparently had circled around behind me, to within 50 yards of where I had sat intently scanning the canyon below. I couldn’t tell how long the cat sat there watching me, but I suspect it took off when I got up. I knew I had been busted, and all I could do was tip my cap and head back to the truck. Targeting trophy bobcats presents one of the toughest challenges in predator calling. But it can be done, and the satisfaction when you connect is well worth all of the time and effort.